Victoria, Ike, and Eric monitoring a scan in progress. Creating this website required a great deal of work outside the digital world. In order to scan all of the objects and make them available in a digital format, we had to work with the Division of Teaching and Learning Technologies and the Thinklab to gain access to the 3-D scanners. We used two different types of scanners for this project, the MakerBot Digitizer and the Kinect with the Skanect software that allowed us to scan objects. 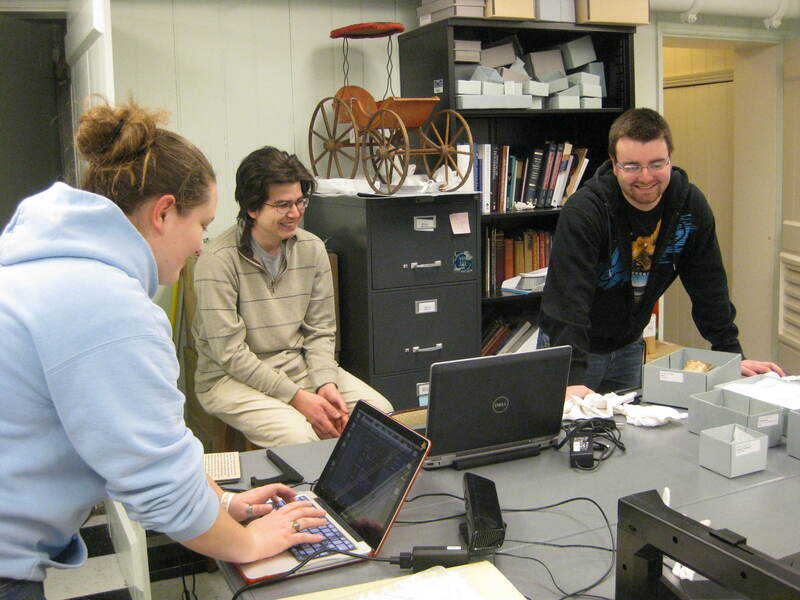 We then had to arrange times to work with the James Monroe Museum and Memorial Library curator, Jarod Kearney, and director, Scott Harris, to scan the objects. This process took some time since we had to learn how to work with the technology and deal with scheduling differences, which included a loss of time with the amount of snow days this year. 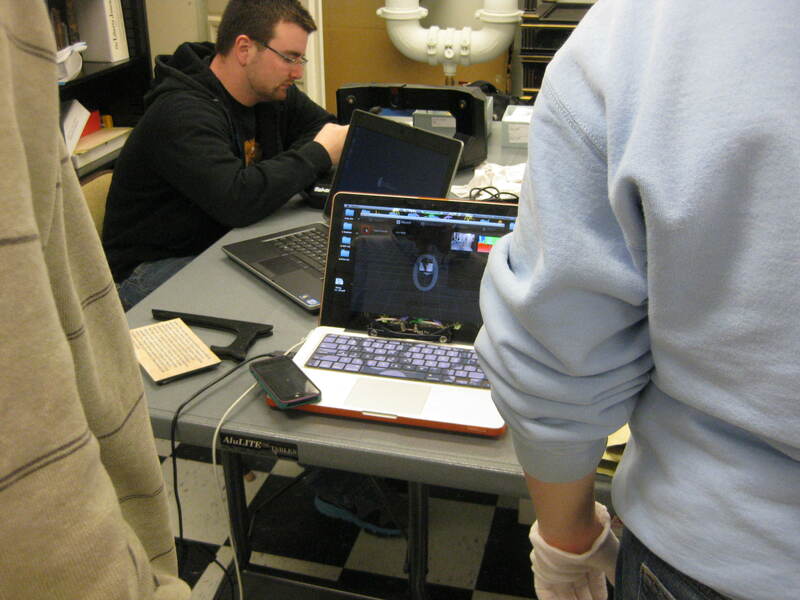 However, we were able to scan all of the objects, even if not in their entirety. Amanda monitors a test scan in progress. Although 3-D scanning and printing is an amazing technological innovation, it is far from perfect. Both scanners share serious limitations, with each individual scanner having unique challenges. The Kinect and the MakerBot were unable to pick up detail on highly reflective objects, such as the original candlestick that Jarod picked for this project. This meant that we had to switch to a less reflective candlestick and rule out other objects due to their reflective nature. Size was also a problem for both the Kinect and MakerBot. The MakerBot could only handle objects between two inches tall to about eight inches tall. Any large objects had to be scanned using the Kinect. If an object was smaller, such as the Peace Medal, then we were simply unable to scan it, which is why we unfortunately only have photographs for the Peace Medal. The Kinect had its own difficulties with size, since it could not handle objects smaller than eight inches. The MakerBot’s main limitation was that it did not pick up color, so any painted pattern or color variation could not come out in the scans. To get complete scans, the MakerBot also required objects to be placed on the revolving plate in different positions. This proved difficult with many of the historic objects that we scanned because some position other than upright compromised the handling procedures for historic objects. Amanda Vercruysse scans the side of the White House Chair. The Kinect’s limitation was the speed at which we could use it. Many times, even if we were moving so slowly you could not actually see us moving, the Skanect software would still tell us to “Go back to last pose” or tell us that there “Was not enough geometry” to get the scan correctly. This is why for some objects, such as the Pianoforte, we were unable to obtain complete scans. However, that is simply a limitation of the technology available, both in the 3-D scanning world and at our University. Below is a video demonstrating the lengthy process of scanning with the Kinect scanner. There were also struggles with getting the technology of the scanners to match up with our computers. Apparently, just because a scanner should work on your computer doesn’t mean that it will actually work. Luckily, the Department of History and American Studies at the University of Mary Washington had a laptop that worked with both scanners, so we were able to use that to complete our scans. Then there was the issue of trying to edit all of the scans to remove unwanted background features that the Kinect picked up. Using the Kinect in the Skanect software, there is an option to choose the box size so that the object will fit, but sometimes this meant that unwanted background features might also make their way into the frame. In order to remove these unwanted details, each group member spent time cropping every scan in the Skanect software. Even though we faced a lot of issues with the actual scanning process and then attempting to mesh them together, we were able to get some scans and even print some objects. Although these scans may not have all come out like we were expecting, they do allow people who were unable to visit the museum and see the actual objects, better understand the physicality of the objects. Although we may not have the technology at this point to make our scans complete or more detailed, with improvements to 3-D scanners, scans will become more detailed and have fewer limitations. Then 3-D scans will truly represent objects and provide online visitors with a better sense of the object’s material and detail. 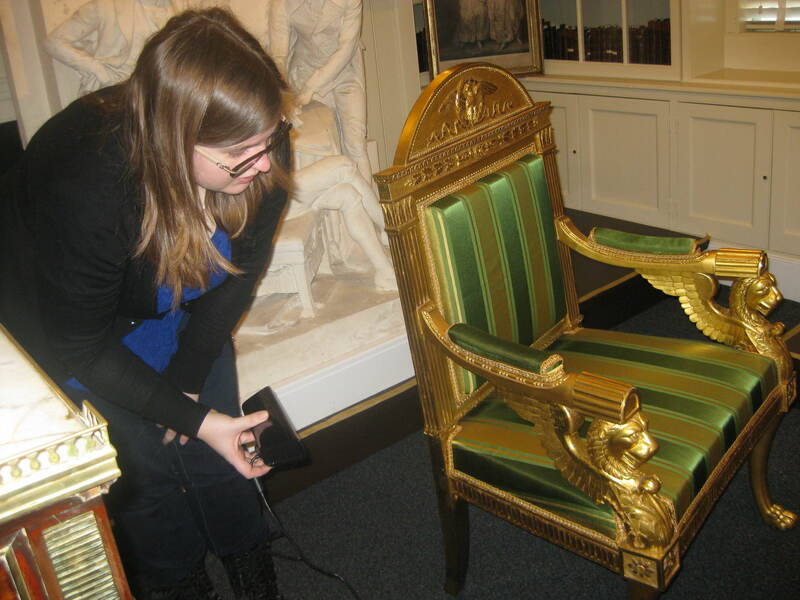 3-D scans will even help conservation, allowing museum professionals to handle printed, replicated objects rather than the original object, helping originals to last longer. It can also help in the education departments where educators can have visitors handle the replicas to get a sense of physical features, again without risking damage to original artifacts. The printed bust of James Monroe. 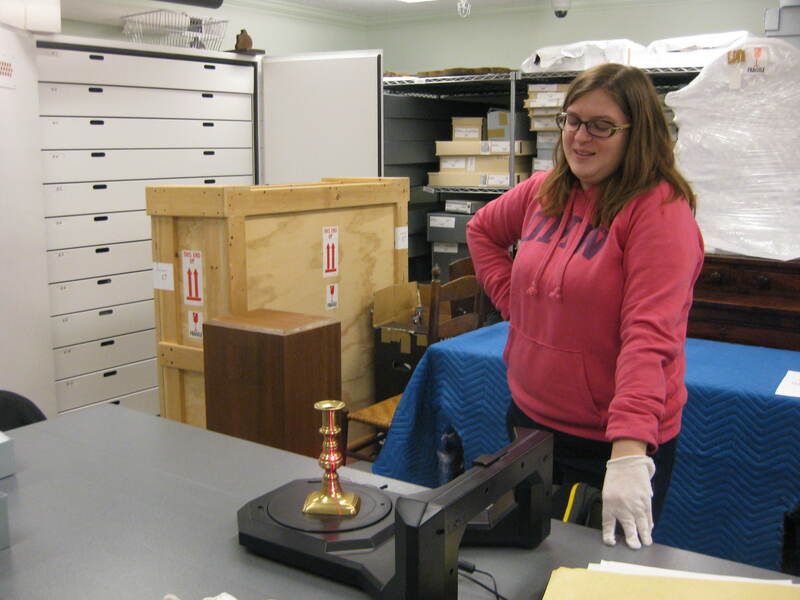 We were able to print two objects for the James Monroe Museum and Memorial Library. 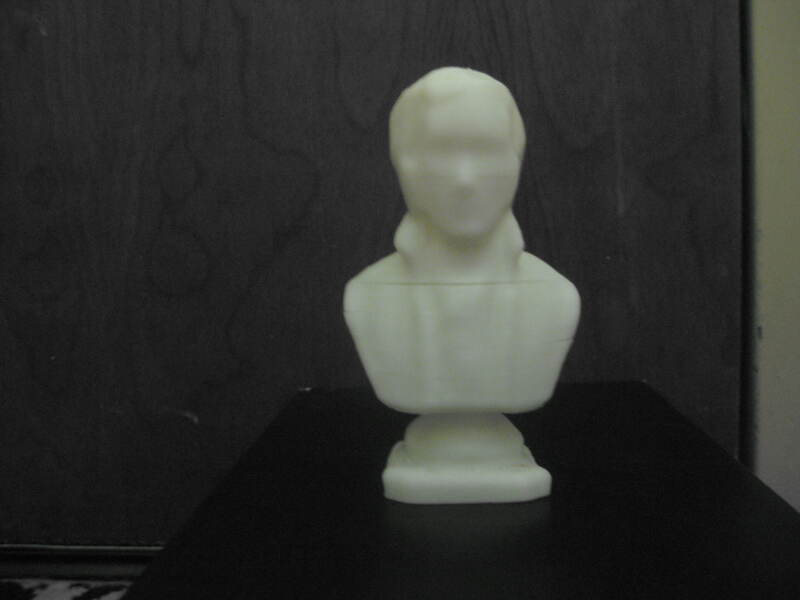 We printed the telescope as well as a small bust of James Monroe. Since we had the scans, printing objects seemed like a good way to test the capabilities of both the scans and the printers. Through printing the James Monroe bust, we noticed that there were small areas that did not fill in, which presented as cracks in the bust. Printing the telescope let us see how the object was not entirely smooth, a subtle feature of our scans. To get a play by play of what we did each week, click here to view our timeline.